Supermarket partners Ralphs Grocery Company and Food 4 Less Stores announced Monday their stores raised more than $300,000 from November through January for Feeding America-affiliated food banks. The funds were raised through Ralphs and Food 4 Less’ annual holiday “Bringing Hope to the Table” campaign that provided customers with an opportunity to donate at each checkstand from Nov. 10 to Jan. 31. In addition, customers shopping at Ralphs stores in Southern California were also able to make monetary donations to end hunger by purchasing “Bringing Hope to the Table” scan cards. 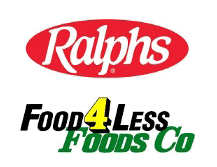 Ralphs and Food 4 Less are both subsidiaries of The Kroger Co., one of the nation’s largest grocery retailers.